Jack French Kemp was an American politician and a professional gridiron football player. A Republican, he served as Housing Secretary in the administration of President George H. W. Bush from 1989 to 1993, having previously served nine terms as a congressman for Western New York's 31st congressional district from 1971 to 1989. He was the Republican Party's nominee for Vice President in the 1996 election, where he was the running mate of presidential nominee Bob Dole. Kemp had previously contended for the presidential nomination in the 1988 Republican primaries. 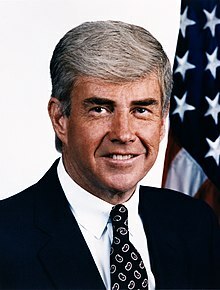 Jack French Kemp (July 13, 1935 – May 2, 2009) was an American politician and a professional gridiron football player. A Republican, he served as Housing Secretary in the administration of President George H. W. Bush from 1989 to 1993, having previously served nine terms as a congressman for Western New York's 31st congressional district from 1971 to 1989. He was the Republican Party's nominee for Vice President in the 1996 election, where he was the running mate of presidential nominee Bob Dole. Kemp had previously contended for the presidential nomination in the 1988 Republican primaries. After his days in political office, Kemp remained active as a political advocate and commentator, and served on corporate and nonprofit organization boards. He also authored, co-authored, and edited several books. He promoted American football and advocated for retired professional football players. Kemp was posthumously awarded the Presidential Medal of Freedom in 2009 by President Barack Obama.